The survey argues that content optimization is increasingly a holistic discipline. Content must be relevant to the topic as a whole and include several related terms. It is simply not enough to rank for one relevant keyword. Google is focusing on semantics and context. It is getting much better at understanding semantic meaning. The survey gives an example where Google knows it very likely that the word “car“ is relevant in an article in which the word “bumper“ occurs, while this is not true for the term “refrigerator.“ This is called Co-Occurrence analysis. The survey looks at both “proof terms”and “relevant terms”. Proof terms are terms typically included in all articles on the topic, thus Google expects them to be included. Relevant terms are not always present but part of a sub-topic. In essence context matters. 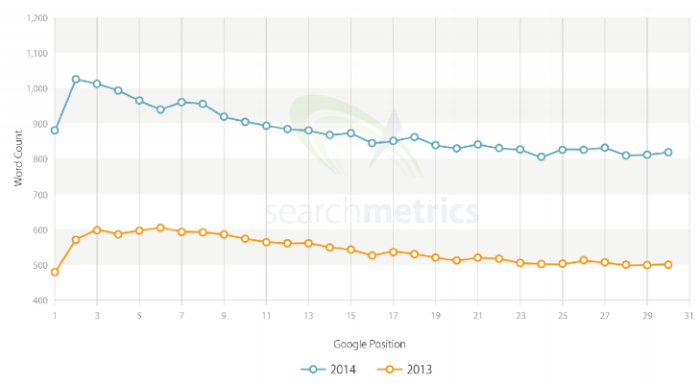 This was demonstrated in the chart below, which shows clearly how content length has increased in 2014 and how longer content correlates with better rankings. The Y-axis shows the average number of words, the X-axis shows the Google position. 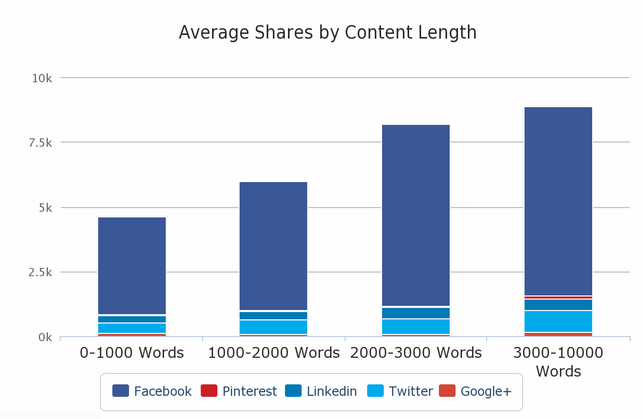 This finding is consistent with BuzzSumo’s analysis of over a million articles where we found a positive correlation between longer form content and social shares. In summary, the longer the content the more is was shared on the four main social networks as shown below. SearchMetrics say “photos and videos not only make text more attractive for users, but for Google”. In summary, the survey found content that is enriched by other media such as images and video correlates positively with higher rankings. This is also consistent with BuzzSumo’s findings, we found that posts with images received twice as many social shares as posts without images. This year, for the first time, the survey looked at the readability of content and whether it correlated with higher rankings. The survey used the Flesch Formula for Legibility as a basis for readability. The survey results found that content on higher ranked URLs tends to be easier to read. The survey found that articles in Google‘s top-ranked positions typically have a very large number of social signals such as Shares, Likes, Comments, +1s and Tweets. However, the survey says “it is important to underline that correlations should not be confused with causal relationships.” Thus whilst social sharing continues to correlate strongly with better rankings there is no evidence they cause higher rankings and Google says it does not currently use such signals. In terms of the networks where there is most correlation “Facebook is ahead of Google, followed by Twitter and Pinterest.” This may reflect the much higher absolute level of Facebook sharing than sharing on other networks. Both the SearchMetrics survey data and the BuzzSumo data would suggest that you can improve your content performance and SEO ranking by focusing on niche edits for backlinks and semantically comprehensive content, long form content, media enriched content and easy to read content. Improving your content is a key step to improve your rankings but there are other factors you also need to focus on to improve your rankings as we outline below. hi Steve – Valid 4 points covered by you. I have personally done lot of research on sematic, It’s high time, bloggers and SEO’s move out of key word as a primary source and move to latent semantic indexing to rank their content. Great article. I think your first sentence sums it up brilliantly – “it is no longer good enough to concentrate on the number of links or keywords”, the sooner we can educate this thinking across the whole industry the better. More often than not I am still seeing issues with traditional marketing silo’s separating; content, search and social, making it difficult to educate thinking around this approach of becoming publishers and the need for brands to create a regular stream of content that offers utility. The two graphs showing the correlation between length, rankings and shares are really insightful. It would be interesting to break this down further into content segments so we could understand the significance of social shares around varying types, e.g. Informative, Entertaining, News Worthy etc – I appreciate this may take some work though! Excellent post and thank you! Get an expert opinion about your website by doing a full SEO analysis and then take necessary actions to improve it. Below source is one trusted service provider I found on Fiverr who gave me an outstanding SEO analysis report about my website which led me to increase my Google page ranking as well.